My client Ty Roden from That Company asked me to develop a plugin, that would allow to check, which email notification was sent to which Redmine users. He also wanted it to display information about sent emails (if any) in issue notes, messages and so on, so an administrator could easily say, which users should have received email notification about particular Redmine object. Ty also wanted this plugin to be shared with the community. Therefore, don’t forget to thank Ty Roden and That Company for this Redmine plugin. The emission email address (From). Recipients’ email addresses (To, CC and BCC). Number of files, that were attached to the email. Note, that normally attachments are not included into emails, that are sent by Redmine. So, you will always have zero here, unless such plugin as Issue Mail With Attachments is installed. Project, to which the email notification is related (if any). Class name and ID of the object, for which the email notification was generated (e.g., Issue #123). Date and time, when the email was sent. Unique Message ID of the email. This ID can be used to find records related to the email in logs of MTA (e.g., Postfix). 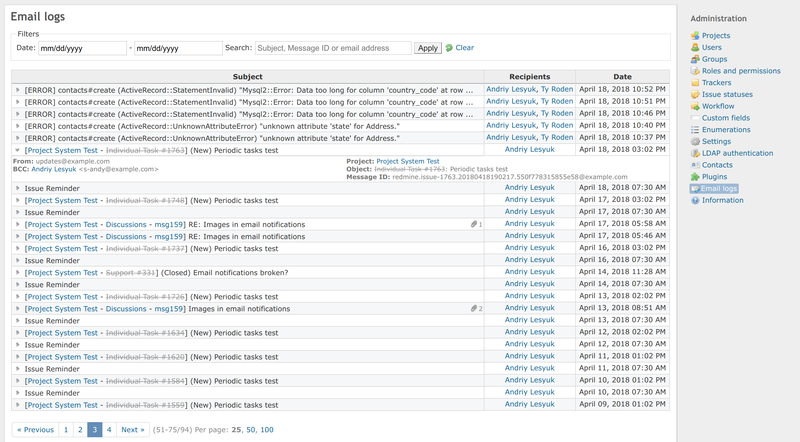 So, the plugin not only saves logs to a database table, but also makes it possible to track, what happened with the email after it left Redmine. Thus, one can use the Message ID to check in the MTAs’ log files, whether the email was successfully delivered to the user. In this list the plugin displays only the subject, names of recipients (or just email addresses, if they are not associated with any users) and the date (also the number of attachments, if any). More details, such as email addresses in From, To, CC and BCC email fields, project, object and message ID, become available, when you click on the arrow in front of the subject. By the way, the plugin attempts to find project and object names in the subject and convert them to links, that will point to the corresponding Redmine objects (so you don’t need to check details to get links to these objects). To make it easier to determine, whether an email notification was sent for the particular Redmine object, the plugin attempts to show the email icon in the contextual menu of the objects, for which email logs are available (so no icon means, that no email notifications were caught). 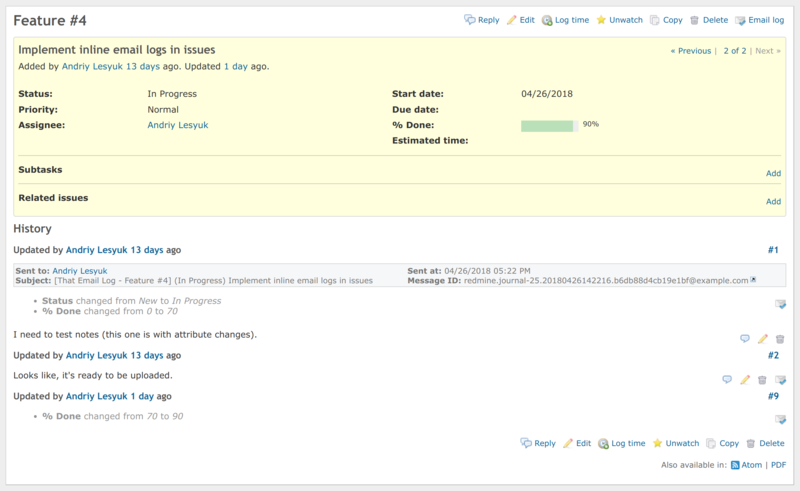 Currently, such icons are displayed for issues, issue journals (history entries), topics and their replies. Clicking on this icon will show a box with some details about the email notifications, that were generated for the object. These details include recipient names, subject, date and message ID. Here, the Message ID is a link, that will open the email log on the Email logs page, where more details can be checked. As the Email logs page these icons in the contextual menu are shown only to administrators.